Pick up from home (or where you tell us) in Finland and delivery to Ireland within 5 days estimated. Shippings to Ireland up to 70% cheaper! Provide all the required data to make sure the delivery can be executed, review carefully the addresses, emails, phone numbers, etc. The maximum weight per parcel is 35 kg, and its perimeter can only be up to 300 cm. When calculating the price, we will let you know is your parcel is too big. Of course, you can ship more than one. Do you want to drop it at Posti or request a pickup from home? 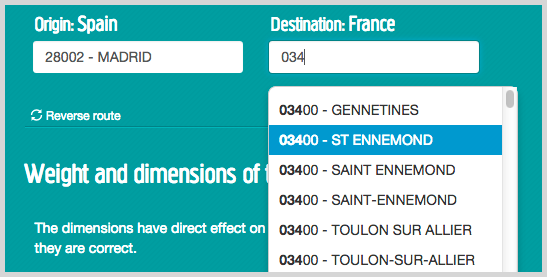 * The options of 09:00 to 12:00 is only available for Helsinki, Turku and Tampere areas. Unfortunately we cannot deliver from Ireland to Finland yet. You could use the Help button and send us a reminder so we hurry up even more. Thanks and sorry for any inconveniences. The company that executes this delivery defines the insurance conditions. In case of loss or damage the insurance will compensate with 8,33 SDR per kg. SDR is a unit defined by the International Monetary Fund which means Special Drawing Rights. This unit can be converted to euros, for example as of 8th of July 2014 the amount of 8.33 SDR is equivalent to 9.46 euros per kg. We have detected incorrect weight values. The minimum weight for this shipping is 1.0 kg. The maximum weight is 35.0 kg.